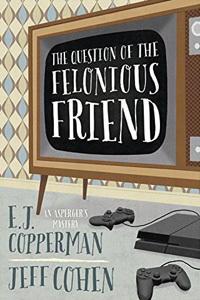 The Question of the Felonious Friend by E. J. Copperman and Jeff Cohen: Synopsis and Online Purchase Options. Synopsis (from the publisher): "Is Richard Handy really my friend?" It's been one year, two weeks, and three days since Samuel Hoenig opened the doors of Questions Answered. The personality traits of his Asperger's Syndrome help him maintain objectivity — a critical component of his business's continuing success.